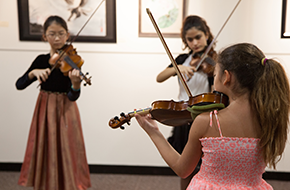 Suzuki Music Studio is a music school that uses the Suzuki Method to teach young musicians in Reston, VA.
Suzuki Music Studio is a music school in Reston, VA that hosts piano lessons, violin lessons, cello lessons, and viola lessons for students of all ages. We plan our courses around the teaching style developed by well-known Japanese musician Dr. Shinichi Suzuki, for our stringed instrument classes. For our piano classes, we organize our lesson plans around a teaching method established by Dr. Suzuki’s long time accompanying pianist, Dr. Haruko Katroka. Our company slogan, ““Every child can" - Dr. Suzuki” is derived from the educational practices that we have adopted. We believe that every one of our students can find their musical voice with the right training. In the 30 years we have been teaching music, the core principle of our studio curriculum has not changed. 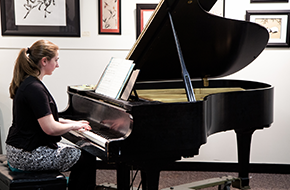 After our students have learned and practiced their instruments, they are invited to attend public recitals where they will perform different songs to show their hard work. With both group and solo performances, students have the opportunity to show their group skills and showcase their individual talents. 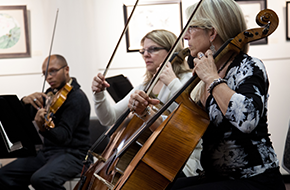 Our instructors act both as the conductor for class performances and as the accompanying pianist for soloists. At Suzuki Music Studio, we encourage our students in a variety of ways, but a child’s biggest encouragement can come from their parents. Parents play an important role in the unique approach our school has adopted. We strongly encourage parents to join their children in our fun classes and learn with them. Come to our unique music classes with your child today!